During dry times and drought there are a wide range of alternative feedstuffs that can be used to maintain and grow stock. Some of these feeds can have health risks associated with them, or should not be used as the sole food source as they may lack sufficient energy and protein. A wide range of by-products and novel feedstuffs have been fed to sheep (Table 1). The nutritional value of by-products can vary greatly so before using any unusual feedstuff, have it tested for energy and protein. If appropriate, these feedstuffs can be effectively incorporated into mixed rations. It is also important to ensure that the by-product is free from any chemical residues or meat products. Be sure of the continuity of supply of the feedstuff before including it in sheep rations. The introductory period for novel feedstuffs is usually when problems will occur. As with any change in feed, novel feedstuffs should be introduced gradually over a period of 10-20 days. Ensure stock have spent a day consuming roughage before the introduction of any novel feed. Introduce a small amount to begin with, gradually increasing over time. It is highly recommended that contact be made with a nutritionist, or livestock consultant, for further information on ration formulations. These are unusual feedstuffs and careful consideration should be made. For example, onions have been successfully fed, however they are only 10% dry matter (DM) and therefore of low feed value. They have also caused deaths in cattle but not in sheep. Some products such as sawdust and paper are extremely low in feed value and sheep would require more energy to eat and digest it than they would receive from the feed. Their only role is to be mixed with grain if no other source of roughage is available. Urea can be used to boost the protein content of low protein feeds but in a drought the major deficiency is energy. Urea will only be of benefit if the ration is deficient in protein but contains enough energy. For each addition of urea, crude protein increases by nearly three times (that is, 1% added urea boosts crude protein by 2.75–3%). Urea does not supply true protein so it cannot be used as the sole source, or to supply the protein needs of very young stock. Feeding urea with low energy roughage (such as straw), without an energy supplement, has little value as the diet will still lack energy. Cereal grains are often too low in protein to meet the requirements of growing or lactating sheep. When grain legumes or high protein hay are not available or are too expensive the addition of urea can be used to increase the protein equivalent of cereal grain. Urea can safely increase the protein level of grain by up to 3.5%. Adding urea to oats can be of benefit when the crude protein to energy ratio is not 1:1. That is, oats with a crude protein content of 8% and energy content of 10 megajoules per kilo (MJ/kg) DM treated with 1% urea will result in improved performance of sheep fed treated oats compared with no treatment. Research work on treating straw of low quality hay (crude protein levels below 7%) does not result in better performance of sheep when fed treated roughage. This is because the energy content of the roughage is below 8MJ/kg DM. Whilst you do get an increase in crude protein levels, unless there is available energy in the rumen to utilise the extra crude protein, the excess protein is very quickly excreted in the urine. A urea solution is made by adding urea to water (normal fertiliser grade urea can be used). Dissolve 100kg of urea in 200 litres (L) of water. The solution will become very cold during mixing and this reduces its ability to dissolve the entire quantity of urea. Starting with warm water will speed up the process. Stir the solution several times over a day or more. After the urea has dissolved, add 20L of this solution to every tonne of grain. This adds 10kg of urea per tonne (or 1%) and will increase the protein by nearly 3%. The addition of 20L of solution to a tonne of grain, particularly oats, will not cause any augering problems. However, it may take up to two hours for the grain to dry. Other grains can not absorb as much water. Start at half the rate of water and increase only if needed. A practical method of applying the solution to the grain is to drill a hole in the auger wall and drip the solution onto the grain as it flows past. As dampened grain significantly slows the rate of flow of grain, the rate of application of the solution needs to be adjusted accordingly. Record the time it takes one tonne of grain to go up the auger. Adjust the flow rate so that 20L of solution flows in over this time. An alternative method is to use a sprayer to mist the solution onto the grain as it leaves the top of the auger, or as it goes into a feed bin. The solution can also be added to the grain while it is mixing in a mixing wagon. The solution can be evenly poured over the grain in the feed trough using a watering can. Stir it in well before the sheep have access to it. This method of adding urea is very safe. Urea can be added to drinking water but it is not as effective as treating grain. Sheep fed urea may need extra sulphur to fully utilise the urea. The easiest way is to add sulphur dust at 5-10% of the rate of urea. Sulphur dust is cheap and available from fertiliser outlets or garden shops. Alternatively, sulphur can be added by replacing 20% of the urea with sulphate of ammonia; this mixture however is more corrosive. Gypsum can also be used as a sulphur source. If properly stored in a silo, the treated grain can be retained for at least six months without any significant loss of quality. To avoid accidental feeding to non-ruminants, silos containing treated grain should be clearly identified. The microbes in the rumen take two weeks to adjust and to fully utilise the urea. For this reason, build up to the full rate over two weeks. If necessary, once the stock have adapted to the treated grain, the rate of urea can be increased to 1.5%. To do this, add 150kg of urea to 200L of water and still use 20L of water per tonne of grain. The grain becomes unpalatable with over 2% urea. Once using treated grain, the stock should be fed at least three times a week to keep the microbes in the rumen fully using the urea. Urea is toxic to non-ruminants such as pigs, horses and poultry. Urea can also be toxic to ruminants if they consume high doses. Apart from urea blocks, never feed solid urea to ruminants. 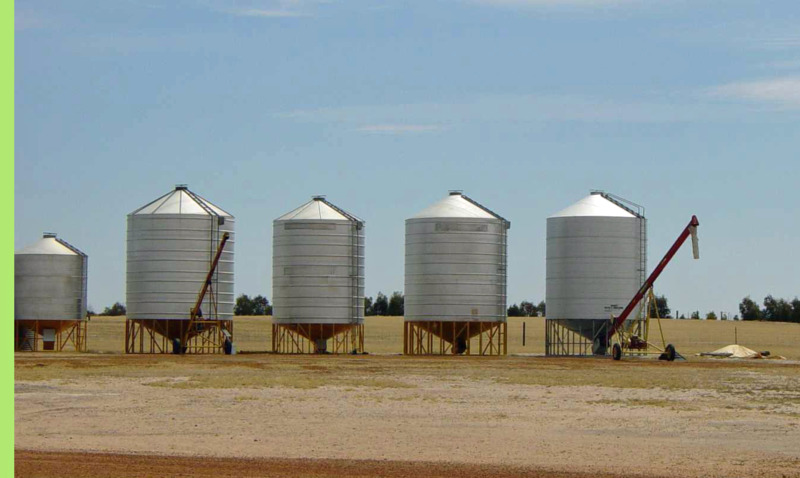 Feed carts should be emptied before making new batches of treated grain as the run-off from the new batch can increase the urea concentration in the remaining grain. Do not feed other urea supplements to stock while they are being fed with treated grain. The combination of urea and water is corrosive on metal surfaces such as augers, metal containers and feed carts. Hose feeding equipment out with water after using urea. Many methods of straw treatment have been tried to improve its feed value. Unfortunately, most of these treatments have proved uneconomical or impractical and many researchers have concluded that it is best to simply use cereal grain, or a grain legume, to supply the additional energy and protein. If straw treatment is required, adding urea is the most practical solution. Urea can be added directly to straw to increase its protein equivalent. Dissolve 10kg of urea and 2kg of sulphate of ammonia in 200L of water. Weigh a few bales so that you can calculate the correct volume of urea solution per bale. The weight of straw bales is about half the weight of similar sized hay bales. 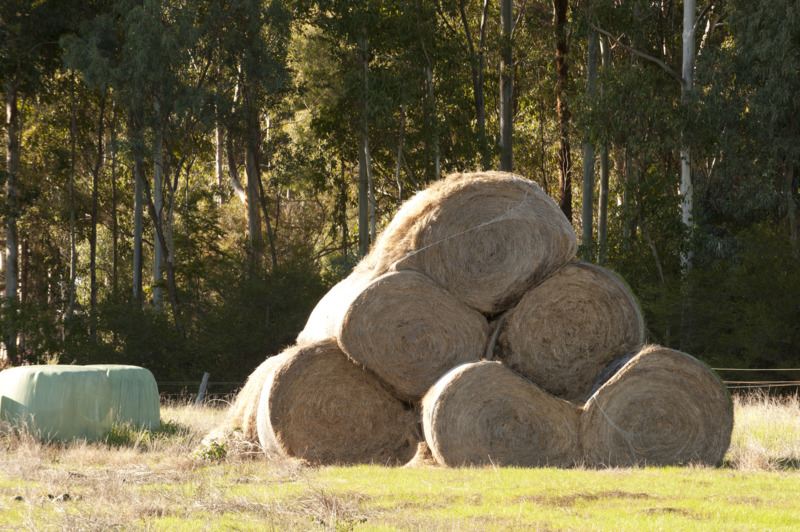 A large round bale will weigh around 300kg and a large square bale will weigh around 400kg. Lay the bales on their side and pour the mixture over them at 45L/100kg of straw. The treatment will increase a 3% protein straw to a 6-7% protein equivalent. Treated bales can be stored for months and they do not go mouldy because the ammonia acts as a preservative. The action of the ammonia on the straw could slightly increase the digestibility of the straw if the bales are covered to be airtight and left for at least three weeks before use. Improved cart collection systems for chaff residues have increased the availability of the higher quality components of cereal, pulse and canola crop residues by allowing separation of harvested material into leaf rich and stem-rich components. Chaff heaps from the collection process can provide an accessible source of feed at specific locations in the paddock. Alternatively, they can be collected and used as part of a ration in confinement feeding systems. Chaff cart residues are generally capable of maintaining adult sheep as the average energy content of collected material - around 7.5MJ metabolisable energy (ME)/kg DM - is close to the sheep requirement for maintenance. Chaff cart residues may require supplementation with additional protein (such as lupins) if the protein content of the diet falls below 7%. Young sheep will begin to lose condition on chaff cart residues if the energy is below 8MJ ME/kg DM. The nutritional value of chaff cart residues varies depending on the proportion of weed seeds, cereal grain and fine leaf material in them. In large stubble paddocks, the provision of strategically placed chaff heaps may improve the utilisation of stubble across the whole paddock, increase the number of grazing days and reduce the amount of supplementation required if deferring grazing to autumn. However, in drought conditions, these stubbles may not be available for long and the risk of erosion may be greater if sheep are left to actively search for food. Sheep may also begin to lose condition if expending energy to find food, so confining them and feeding the chaff residues within a small area may be a better option. The risk of annual ryegrass toxicity (ARGT) and lupinosis is higher if chaff is heaped. Molasses can be used to improve the palatability and energy value of straw. However, adding sufficient molasses to noticeably improve palatability and energy levels will be expensive. A 200L drum of molasses costs about $190 and weighs 250kg (therefore $760/tonne). Molasses has 13.3MJ ME/kg DM and contains 75% DM, therefore each MJ costs 7.6 cents (c). In comparison, feed barley grain at 12MJ ME/kg DM and 90% DM at $170/tonne costs only 1.6cents/MJ. Molasses should only be considered an option as an energy supplement when unpalatable straw is the sole source of roughage available to sheep. However, it may be useful in small quantities in total mixed rations to bind ingredients together and stop fine particles from separating in the mix. If straw is the only feed source and is particularly unpalatable due to dust or a bad odour, dissolve 60L of molasses in 200L of water when treating straw with urea. This may help to increase palatability of the straw. If lupins are available, then adding molasses to unpalatable straw will encourage roughage consumption. trace mineral mix: as per manufacturer’s instructions. The lime used should be agricultural lime/stock lime (calcium carbonate which is around 37–40% calcium), limestone or limesand (but not burnt lime). Burnt lime reacts with moisture and may burn the lips and mucous membranes of stock. Gypsum (calcium sulphate) can also be included as a mineral supplement to grain rations to supply calcium and sulphur. Use gypsum which contains more than 17% sulphur; this can be added at 5-7kg per tonne of grain. Add minerals to a trail feeder with the last 75% of the grain as the minerals are likely to move down through the grain while the trail feeder is being taken to the sheep. It is best to incorporate the minerals as the grain is being augured into the feed trailer. Commercial mineral blocks can be an expensive option compared to other methods and there is no guarantee that all sheep will use them. The purpose of adding a buffer to a feed ration is to reduce the formation of acids in the rumen when introducing grain or feeding high levels of grain. Sodium bicarbonate has been added to help reduce the possibility of acidosis at 0.5–1% of the ration, however reports indicate that it can cause bloat. Sodium bentonite, a clay, can be added at 2% during the grain introductory phase, then reduced to 1% and removed completely after another week. These buffers are not effective in reducing acute acidosis and are not a substitute for good grain introduction or including sufficient roughage in the ration. Australia continues to be free of bovine spongiform encephalopathy (BSE or mad cow disease). One of the control measures to maintain this status is a ban on the feeding of restricted animal material to ruminants. Examples of restricted animal material include meat meal, meat and bone meal, blood meal, fish meal and poultry meal. Feeding these materials to ruminants is illegal. Ingredients are often added to pellets to improve feed conversion rates or to reduce the likelihood of acidosis. These additives include antibiotics, anti-protozoals or ionophores. Products containing any medications are required by law to be labelled as such. Information on medications added to manufactured feeds will appear on labels, sales orders or invoices. It is important that you check in advance that your market will accept animals that have been fed antibiotics. Contact your veterinarian for further details.